This quaint log cabin was built in the late 1940s by some of the area’s first pioneers. 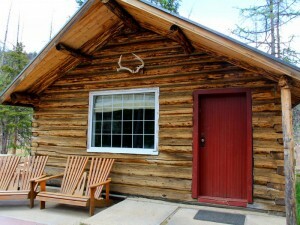 It is located close to the lodge and has views of Quiniscoe Lake. Inside it features seven bunks, cold running water, a wood-burning stove and simple kitchen. Guests use the washroom and shower facilities on the main floor in the lodge. This cabin is ideal for families or groups of up to six (6) people.